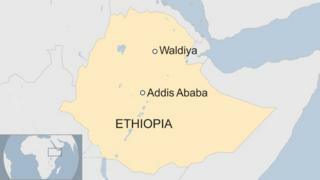 At least five people have been killed in northern Ethiopia after security forces fired on a crowd at a religious festival who were reportedly shouting anti-government slogans. Many more were injured in the incident in the town of Waldiya. Angry protesters have blocked roads and businesses are closed. There have been nearly three years of opposition demonstrations in Ethiopia. On Wednesday, hundreds of activists were released from jail. The deaths happened during the second day of Epiphany, when Orthodox Christians commemorate the baptism of Jesus. Dozens of people are reportedly receiving hospital treatment after the shooting. What is behind Ethiopia protests? What do Oromo protests mean? Anti-government demonstrators in Ethiopia have been calling for political and economic reforms and an end to state corruption and human rights abuses. Among the suspects released from detention by the government on Wednesday was prominent opposition leader Merera Gudina, who spent more than a year in detention. At the beginning of January, Prime Minister Hailemariam Desalegn announced the government would close Maekelawi - a detention facility in the capital, Addis Ababa, allegedly used as a torture chamber. The Ethiopian government imposed a state of emergency from October 2016 to August 2017 to end an unprecedented wave of protests against its 25-year rule. More than 11,000 people were arrested, mostly from the Oromia and Amhara regions, where many people complain of political and economic marginalisation. Are protests a game changer?